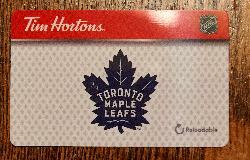 A 2017 Tim Horton's gift card. Commemorating the NHL's 100th anniversary. Depicts logos of current 2017 NHL teams, along with the National Hockey League's 100th anniversary logo. A special Tim Hortons coffee cup with images and Sidney Crosby and Nathan MacKinnon on the front of the cup. This cup was part of the fall drive for Upper Deck Hockey Cards from Tim Hortons. this particular image is the front of the cup. A special Tim Hortons coffee cup with images and Sidney Crosby and Nathan MacKinnon on the front of the cup. This cup was part of the fall drive for Upper Deck Hockey Cards from Tim Hortons. The front of the Tim Hortons medium coffee cup in fall 2018. Depicts a bio of Tim Horton himself. States that their found is Miles Gilbert 'Tim' Horton. This is the Canadian version, found in Ontario. 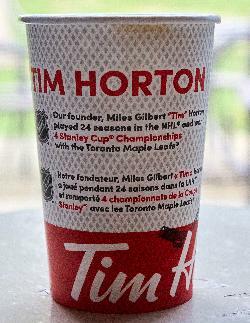 The front of the Tim Hortons medium coffee cup in fall 2018. 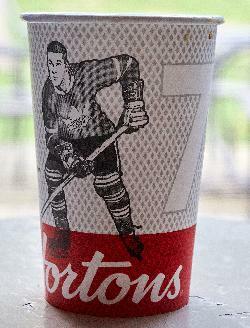 Depicts Tim Horton himself, the number seven, and a Maple Leafs logo. This is the Canadian version, found in Ontario. 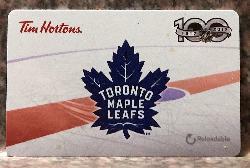 A 2018 Tim Horton's gift card. With the Toronto Maple Leafs' logo displayed in the center. The NHL logo appears in the top right corner. 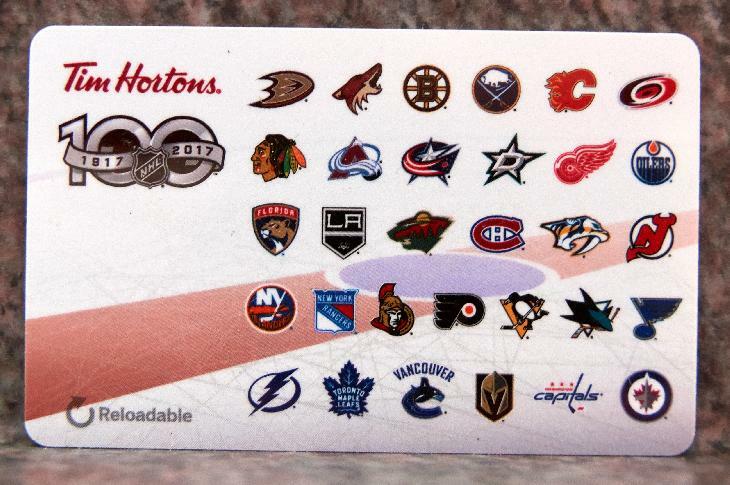 A 2017 version of the Tim Hortons Christmas themed gift card. Depicts coffee cup along with a couple of wrapped items. 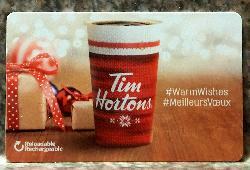 A 2017 Tim Horton's gift card. Commemorating the NHL's and the Toronto Maple Leafs' 100 anniversary. Depicts a Leafs logo, along with the National Hockey League's 100th anniversary logo. A 2017 version of the Tim Hortons Gift Card envelope. Shows the year that Tim Hortons was established, 1964.